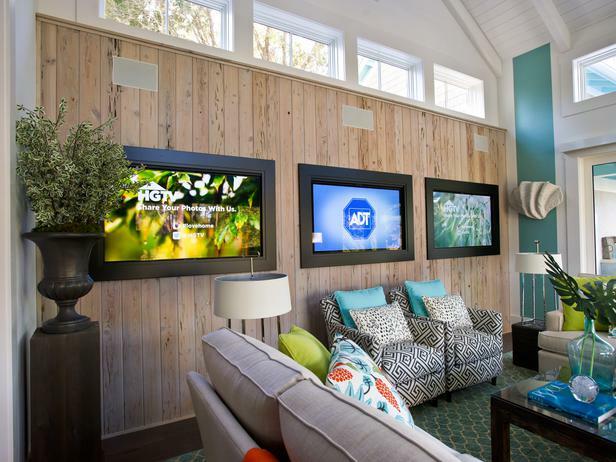 Yesterday, I just happened upon the HGTV website, and I saw all of these mentions about a 2013 HGTV Smart Home. I was like “whaaaaat?” How long have they been doing this? I knew about the annual Dream Home, and the annual Green Home (which I completely missed this year!! ), but I don’t think I’ve ever heard of the Smart Home. How long have they been doing this?! Let’s start with the exterior. 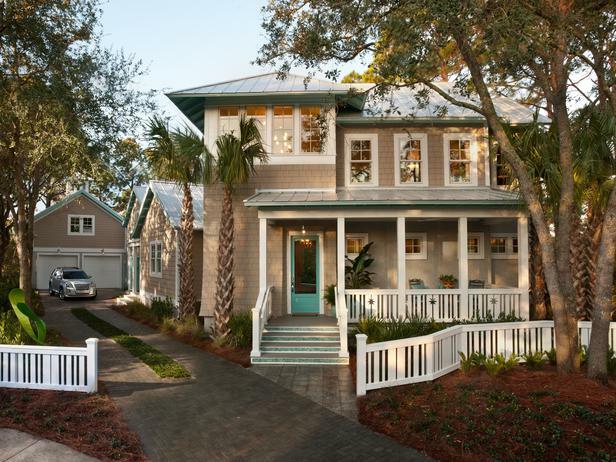 I love the aqua front door and accents, the metal roof, and the shingle-style siding. 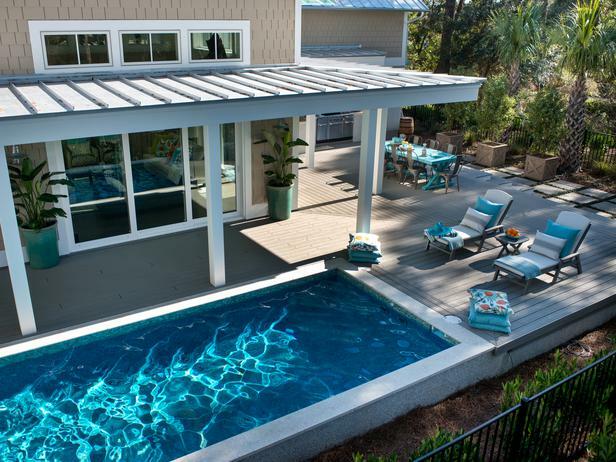 Do you notice how the eaves are even painted an aqua color? (You might have to click over and see the rest of the pictures to notice it.) What do you think about that? 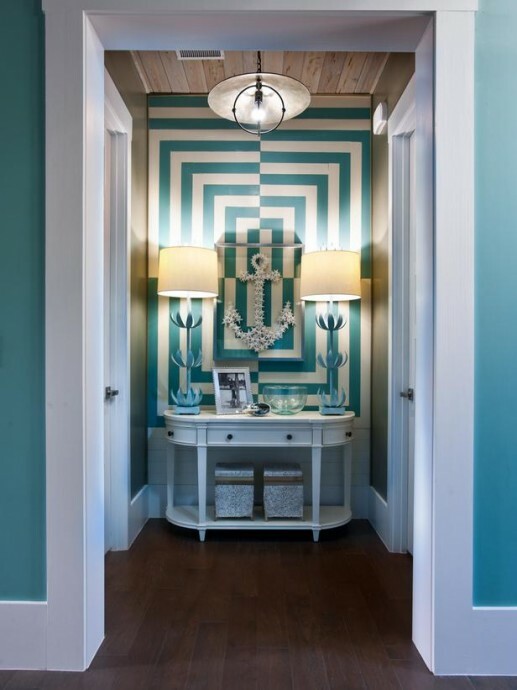 …to this UH-MAZING aqua and white wall with the funky wood and paint treatment!!!! Yes, please. I want. 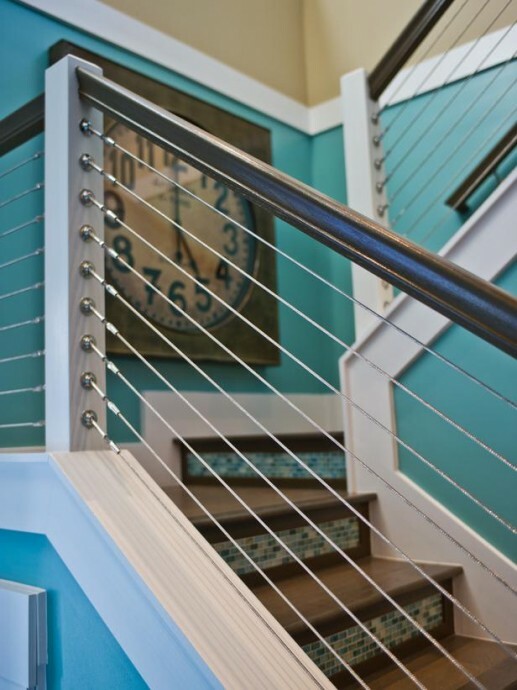 Here’s a closer look at the great stair railing. I really like this modern look. Here’s the kitchen. Beautiful. 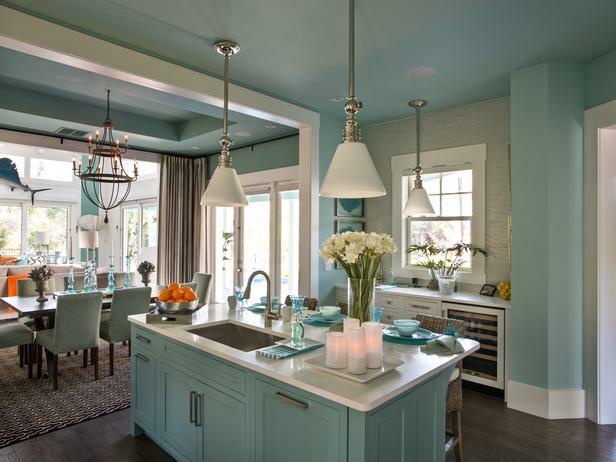 Now I will say that even though I like aquas and turquoises, I think there’s a bit too much of it in this house for my taste. If it were mine, I’d definitely mix in some other colors. But taking each room individually, I really do like this kitchen. Here’s a view from the other direction, looking towards the dining room. 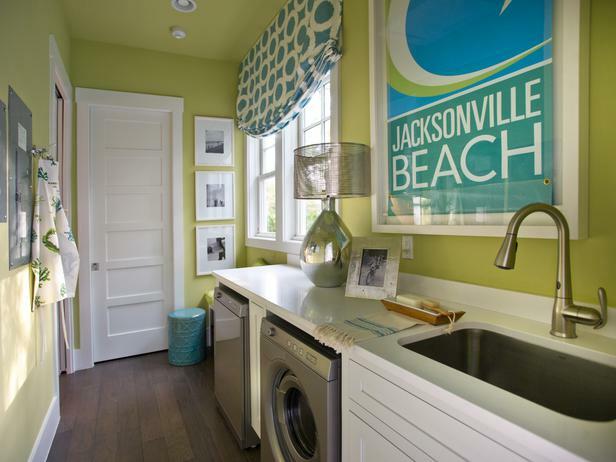 I think these are great colors for a laundry room! Well, I think they’re great colors for any room. 😉 But this laundry room looks so bright and fresh, it might actually make me want to do some laundry. Maybe. The dining room is probably my least favorite room. I don’t really understand the curtains on either side that can partition off the area from the kitchen and/or the living room. I guess I like an open, airy feeling, and I think the curtains (the purpose of which I don’t understand) create a very closed in feeling. Overall, I really like the living room. 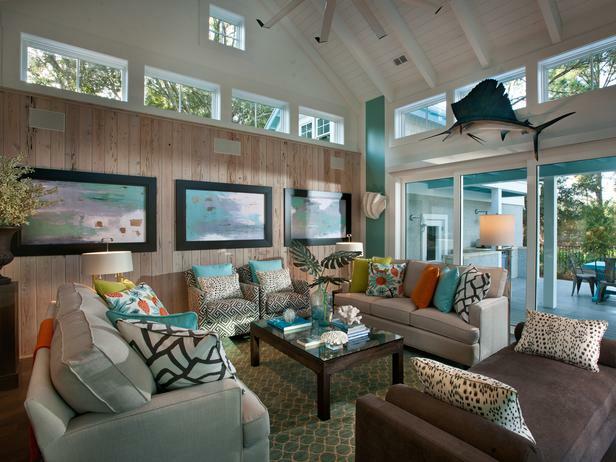 The addition of the other colors really gives this room some life. What I don’t understand is the need for three flatscreen televisions in one room. Granted, I only own one television, and I haven’t turned it on in three years, so perhaps I’m not up on the latest in technology. 🙂 But three televisions in one room? And of course, after a long day of using my tools and creating projects in the garage, I could definitely see myself cooling off in this pool. Doesn’t that look inviting? 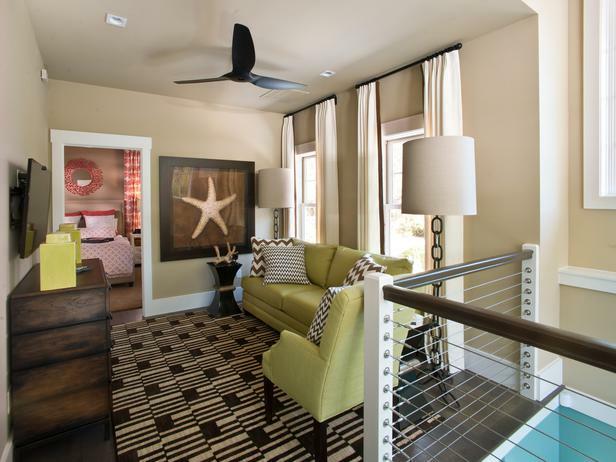 With all of the color used in the rest of the house, the master bedroom seems a bit too tranquil…at least for my taste. But I do think it’s a beautiful room. I especially like the symmetry around the bed. I’m a sucker for near-perfect symmetry. I also really like this mirror. That would be so easy to make! The tile in the master bathroom is a little dark for my taste (or perhaps it’s just that there’s so much of it), but I really like the design of the room, especially how the “wet area” including the tub is separated from the rest of the room by the glass door. And moving upstairs, here’s the loft area. And the guest bedroom. In some pictures, the curtains and bedding look red, and in others, they look orange. Not sure which one is truer to the actual color. I really like the wall color, though! 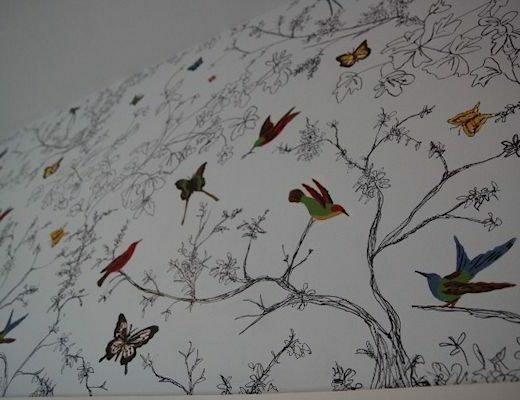 In this particular picture it looks a bit dull, but in other pictures, it’s really very pretty. 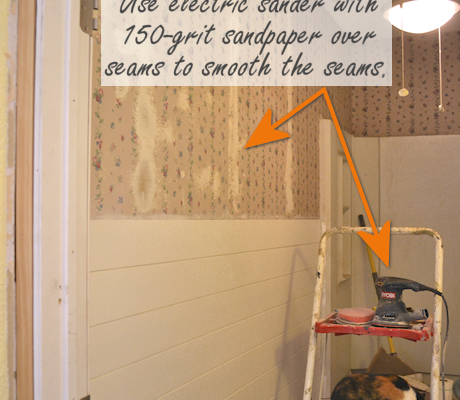 The fabric from the bedding is carried into the guest bathroom as a shower curtain. 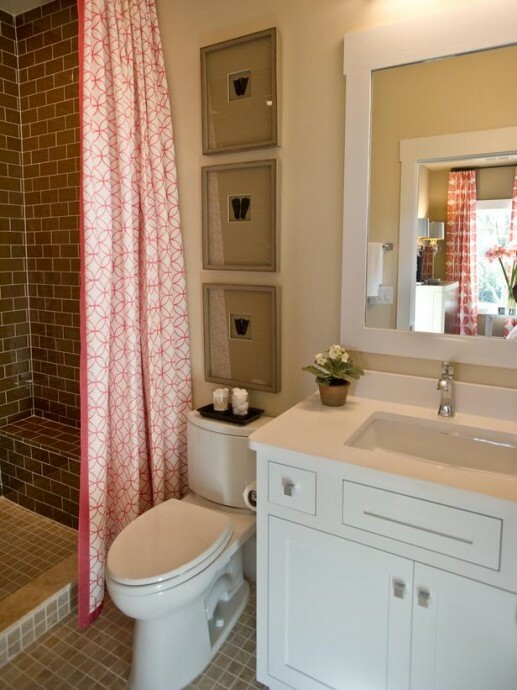 I really like the fabric, and I like the brown glass tile, but I’m just not sure I like them together. What about you? Overall, I really like the house. 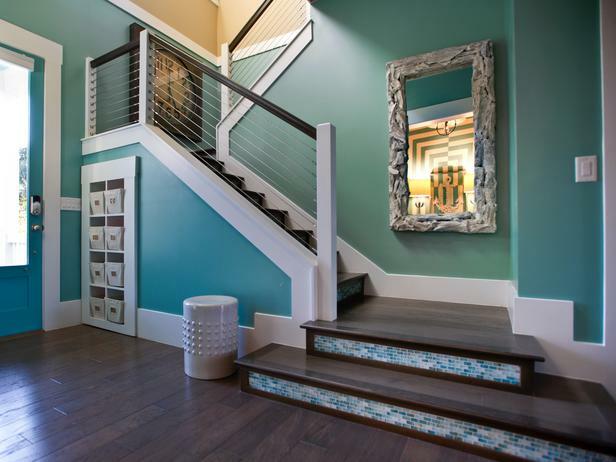 The exterior is very pretty, with the touches of aqua, and I think my favorite interior space is definitely the entryway!! 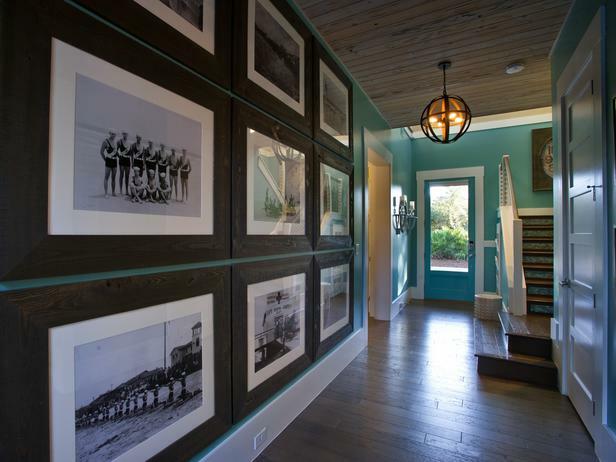 You can see about a thousand more pictures of the house on the HGTV website. So what do you think about the house? Have you entered to win it? I love the front of the house, and I def agree with you that the entrance is beautiful. I’m just a little turned off by so much aqua throughout the house. I think the kids’ room could’ve easily been a different color, and while I love the tile on that bathroom, I think it doesn’t go well with the other patterns (tissue box, shower curtain, bedding, etc). It doesn’t look like a fun kids’ bathroom/bedroom to me. 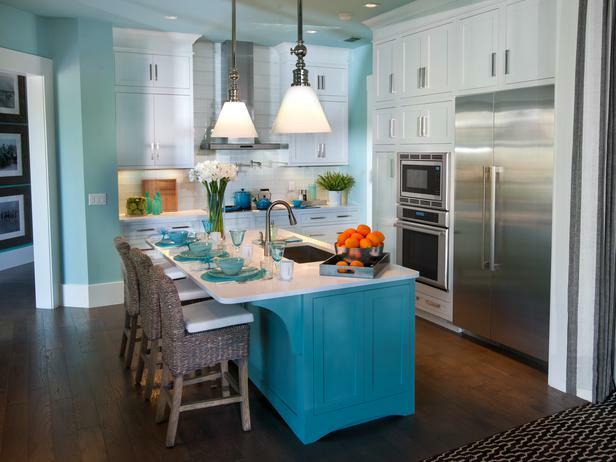 The kitchen is lovely, but I would’ve liked the island to be a different color. I think this aqua color might be a trend as it was also used in the life-size Target Dollhouse in Grand Central http://www.iheartorganizing.blogspot.com/2013/05/targets-real-life-dollhouse-display.html. Whoa that IS a lot of aqua!! I think my fave room actually was the more neutral bedroom. 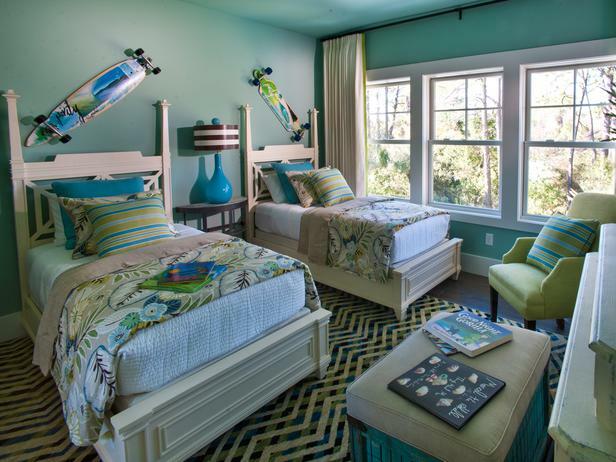 😉 But the thing that always jumps out at me when I’m perusing homes from all over the country is how people hang big, heavy things right above the bed — like those skate boards. (not that they are even THAT heavy) But I live in California, and you know what that means, lol. No heavy mirrors or pictures or cool ironwork (or whatever) unless you want to take the chance of it being jostled loose by the next 7.0 and having it land on top of your head! Oh, good luck with all your organizing and cleaning and shelf building and ALL the stuff you are doing to prepare for your move. Wheeeeee! WHOA Nellie! That’s a lot of aqua! I don’t get the 3 Flatscreens either. I mean I guess you can probably browse the net on one? Watch a movie on another and cycle through your house stats and security video on the 3rd? lol I got it! Control Room Chic?! bah ha ha.. 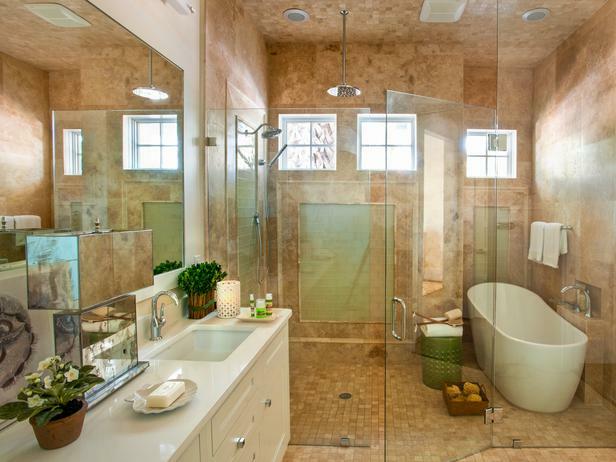 I do love the bathrooms and all the tile- but oy vey all that squeegeeing, and cleaning… um no. But I guess if you have a house that big- you hire someone for that. lol It is definitely gorgeous. I love all the space though. I have been entering daily! 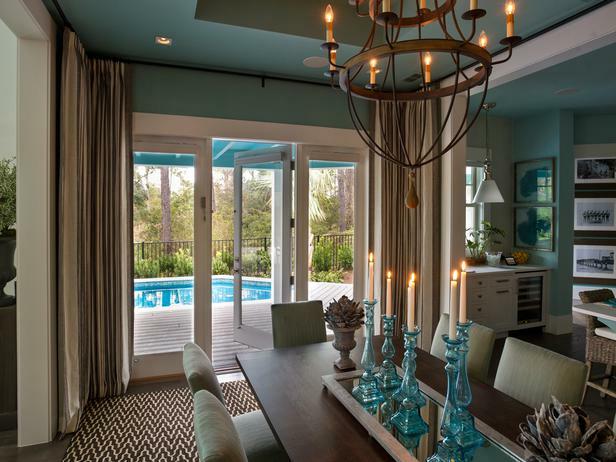 I love the house but definitely agree that the curtains in the dining area are not needed and some of the aqua is overdone. But overall it’s amazing! Yeah, I don’t like the curtains in the dinning room. Like the coloring of the house. I have a friend and her house is the same color but the color is gradually different from room to room. ( shade lighter). It is pretty. I am thinking that’s what they did here. You did say that it looks different in other pictures. Thanks for show us the house! 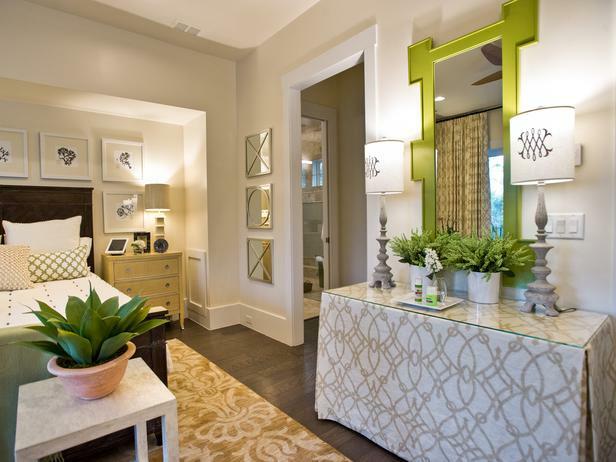 It looks like the draperies in the dining room are meant to surround the room. I think that would be an amazing dining experience. If I lived there I would have the draperies pulled back as far as possible, or get rid of them. I love the aqua. Who is the designer? Agree. They look nice pulled back and they’re probably nice completely closed if you’re in the dining room and want a more formal feel, but they look weird in the half way position they used for the photo. The three tvs are just weird – I’d guess it is a guy thing to watch multiple games at once or something or maybe there are some sort of headsets for the sound so the family can sit together and all watch different things at once. I love this house! I’ve been entering every day. I’m sure that means I’m going to win it. 😉 It was fun to tour it again through your eyes. It made me smile at some parts – I didn’t even notice the 3 TVs! What’s “green” about 3 televisions? This is not the GREEN house, Laura . . . it’s the SMART house with all the latest technology systems. Overall, it looks like a really nice home and wouldn’t it be nice to own it? 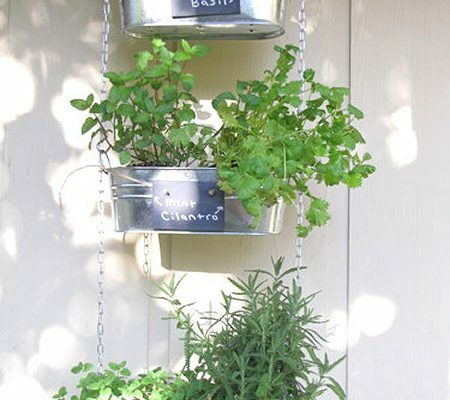 However, I have to agree with one of your postees : ) that it would be impossible to own because of the taxes and upkeep. As for the decorations, I like the aqua but it is a bit too much. The draperies in the dining room overwhelmed the room but I guess if you like an intimate dining experience it could work for you. 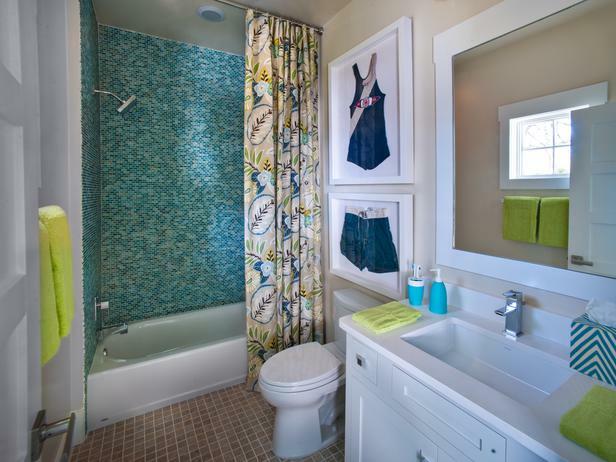 Lastly, I loved the colors in the guest bedroom and bathroom. Red and brown are unusual but in my opinion they play well together! Personally, I LOVE the idea of the deep draperies surrounding the dining area for special occasions ! Most people most of the time do want all that lovely open concept living . . . but at the same time, a formal dining area is sometimes one of the “must haves” in a nice home, but it usually the LEAST used room of the house ! 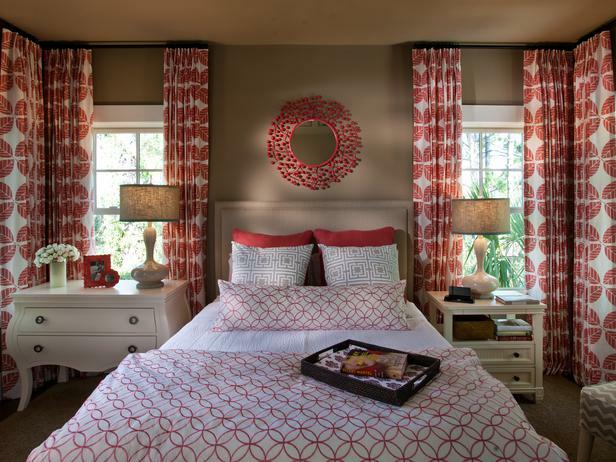 Using the beautiful draperies accomplishes BOTH needs ! I’m sure that the drapes are shown in that partially open way so that the concept of how they would work is understood with only one picture. If you were to have a formal meal, all the mess in the kitchen would be completely hidden from the guests . 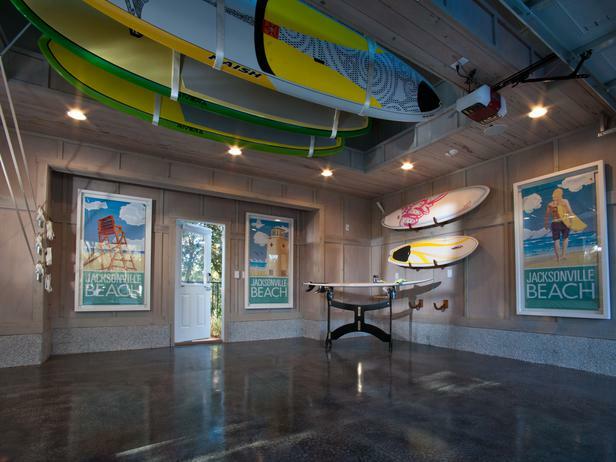 . . and then later, you’d invite your guests into the separate living room for coffee/dessert/wine, etc. My friends have 3 tvs in their living room: one for him, one for her and one for the 3 year old child. I asked why and was told that they like to watch different shows or play games all at the same time. ?? ?